Because we are majoring manufacturing technologies, industry – university cooperation is very important. We are running several programs to promote industry & university collaborations. Yellow one is technical committee. 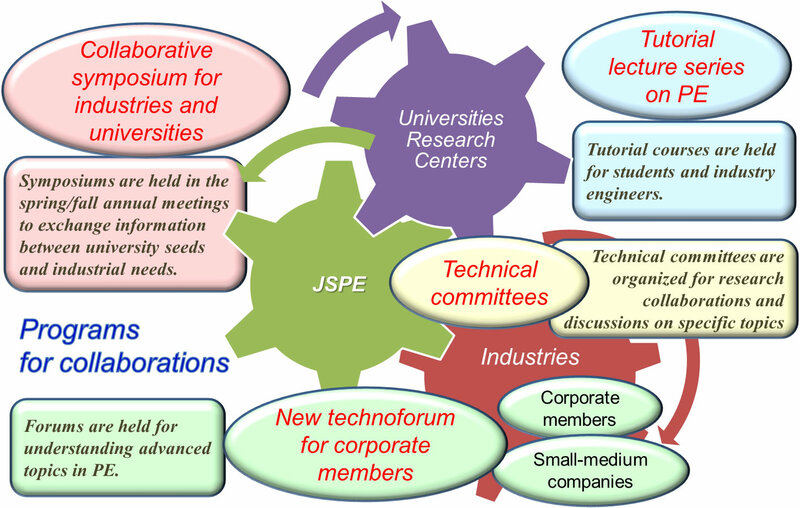 JSPE engineers from both universities and industries are regularly discussing on their specific topics by belonging to the same technical committee. Blue one shows tutorial lecture series for young engineers and students, which we have around 10 times a year. Orange one shows that we arrange various symposium to exchange information between university seeds and industry needs. Green one shows that we have started a technology forum series organized by corporate members at the annual meeting.